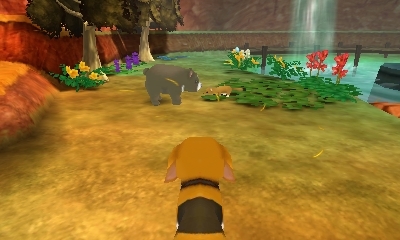 After changing into a dog, go for a stroll "to South Westown"
You spot a bear appearing rather aggressive towards a weasel. The weasel pleads with the bear to calm down. The bear moves closer to the timid weasel and explains that if he could calm down then he would have done so! The bear wonders why everyone is so afraid. True, if anyone enters his territory he'll react, but he's never hurt a lost kid. Yet everone cries and runs away at the sight of him. The weasel does recognize that the bear is scary. Its eyes and scars make it look even more dangerous! The bear gets a little modest and says it has its mother's eyes its scars are from when it accidentally took a tumble. The weasel tells the bear how impressive it is that he somehow got scars just by falling down. Now the bear is getting a bit more modest. Well... weasel seems to be well-liked by children. Maybe the weasel could teach him how to be more liked? What's its secret? The weasel doesn't think he does anything special, but the bear doesn't believe him. Priviledged animals like the weasel really make the bear angry! The weasel detects that the bear is getting mad and concludes that maybe the bear should try to and smile. The bear gives it a try and comes out with quite the frightful smile. It scares the weasel so much that the weasel runs away, with the bear chasing after him, asking for feedback why its smile is evil looking.